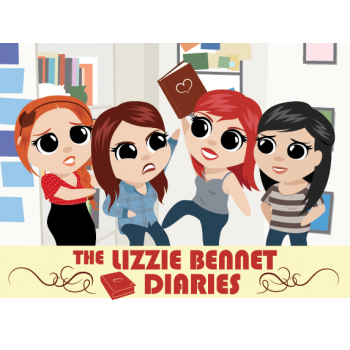 Lizzie Bennet Diaries, Jane Austen, Pride and Prejudice | girlpocalypse. I stumbled upon this web series mid-2012 on The Hairpin’s recommendation. I have been a lover of Jane Austen (or “JA”) books, but especially of Pride & Prejudice (“P&P”), since that time we were forced to read it back in the 11th grade. I’ve kept up with all things JA and P&P in various forms, but mostly fan fiction boards. At one time, I even tried to adapt P&P to the modern day (I don’t think I made it passed the fifth chapter). Others have done it successfully — in writing — but the Lizzie Bennet Diaries is the first time anyone attempted to do a modern-day adaptation on screen (okay, that’s not exactly true, we can’t forget about Bridget Jones’ Diary). Coming up on the 100th episode and series finale, LBD has been my go-to web series every Monday and Thursday since last April. It starts off with a girl named Lizzie Bennet talking to the world through video blogs (“vlogs”) about her life, which happens to follow the plot of a certain Jane Austen novel. Lizzie is played by Ashley Clements, who I will picture from now on when thinking about P&P. She has the wit and personality to keep Lizzie from turning into some annoying girl who broadcasts her problems all over the internet. And she is surrounded by the usual group: Jane, Lydia, Charlotte, Bing Lee, Caroline, Will Darcy, GiGi, Fitz William, Bill Collins, and Kitty the cat. I was worried for the first 20 or so episodes that the story was going to stall and that it would take forever to meet Darcy. And it did take forever, sure, but eventually, I was okay with that. I even started thinking hmmm maybe we’ll never see Darcy, and I don’t think I mind that much. 1. His name is Bing Lee. First name: Bing, last name: Lee. How cute is that? Come on, don’t tell me that’s not cute. 2. Charlotte isn’t just a sidekick with a sad story. She’s actually really cool, a voice of reason when Lizzie spins out of control, and doesn’t end up married to some lame-o named William Collins. 3. You’re going to like Lydia. She’s young and without a responsible bone in her body, but instead of going down the classic route from the book, her story develops (through her own set of vlogs) in a way that makes you really feel for the character. 4. Georgiana is cool too. She takes on a life of her own, helping move Darcy/Lizzie along when she can, and puts up her own vlogs to crack the George Wickham debacle. 5. The Bennet parents do not make an on-screen appearance. Although Lizzie reenacts certain key mom and dad moments, the elders stay out of the vlogs. I always thought the most annoying parts of the P&P movies were when Mrs. Bennet opened her mouth. No worries here! 6. Jane is into fashion! You always knew Jane was the oldest and the pretty one, and the one most likely to win Bingley’s heart and get married and be perfectly content. But in the modern day, Jane has her own lookbook, and has a job in fashion, and is pretty and nice, but not too pretty and nice that you don’t want to like her. 7. The writing + acting is first-rate: the sisters act like sisters; the best friends are totally best friends; the awkwardness between Lizzie and Darcy those first few times is totally awkward; Bing sort of has his head in the clouds; and Bill Collins is just plain weird. And all of this stays true to the story we all love, while giving it those modern updates you always hoped for after reading P&P (and when I say ‘you’, I mean ‘me’ — in case I’m the only one who thinks like this when reading Regency-period books?). 8. You never see Catherine DeBourgh. She’s mentioned, but only in passing. And Caroline is in her share of episodes, but she’s more of a nuisance than anything else. You don’t dislike her as much as the book made me dislike her. You will hate George Wickham, as it should be. 9. Fitz William has a ‘fro. That is all. 10. Darcy! Finally! He doesn’t show up until episode who-knows (60-something), but when he finally walks into the room, he doesn’t disappoint. There you go. Also, it’s a guaranteed happy ending! Everyone knows how P&P ends so you know it’s coming, you’re just worried that it won’t be satisfying enough to squash the fact that you just sat through 98 or so episodes before getting the resolution. Well, fear not, there’s some happiness and on-screen kissing and it’s good! Also, it’s basically over, you could watch all 100 episodes in a day and still have time for a late lunch. Did I mention the Kickstarter project to put these videos onto DVDs? Here we go. This entry was posted in chick lists, out of the box, web series and tagged Jane Austen, Lizzie Bennet, Lizzie Bennet Diaries, Pride and Prejudice by Cara. Bookmark the permalink.